For this discussion, the assumptions and ideas of plate tectonics are used unchallenged to show their internal problems regarding mountain building (orogeny). Quotes are from professional journals. Study of the motions of plates is called kinematics, while study of the driving forces is called dynamics. "A key to the simplicity of plate tectonics is that the strength of lithospheric plates enables the analysis of their kinematics to be isolated and treated separately from the dynamic processes controlling plate motions; relative velocities of plates can be analysed without reference to the forces that give rise to them"34. Around the end of the first decade of dominance by plate tectonics, in 1975, the situation was described this way: "In recent years, the kinematics of continental drift and sea-floor spreading have been successfully described by the theory of plate tectonics. However, rather little is known about the driving mechanisms of plate tectonics, although various types of forces have been suggested"14. Seven years later, in 1982, the assessment was: "At the present time the geometry of plate movements is largely understood, but the driving mechanism of plate tectonics remains elusive"3. By 1995 we find that: "In spite of all the mysteries this picture of moving tectonic plates has solved, it has a central, unsolved mystery of its own: What drives the plates in the first place? '[That] has got to be one of the more fundamental problems in plate tectonics,' notes geodynamicist Richard O'Connell of Harvard University. 'It's interesting it has stayed around so long' "25. In 2002 it could be said that: "Although the concept of plates moving on Earth's surface is universally accepted, it is less clear which forces cause that motion. Understanding the mechanism of plate tectonics is one of the most important problems in the geosciences"8. A 2004 paper noted that "considerable debate remains about the driving forces of the tectonic plates and their relative contribution"40. "Alfred Wegener's theory of continental drift died in 1926, primarily because no one could suggest an acceptable driving mechanism. In an ironical twist, continental drift (now generalized to plate tectonics) is almost universally accepted, but we still do not understand the driving mechanism in anything other than the most general terms"2. The problem has always been that it is hard to discern what is going on deep in the Earth, motion is almost imperceptably slow, and different combinations of forces, perhaps varying over time, could apply to particular areas. "When the concepts of convection and plate tectonics were first developing, many thought of mantle convection as a process heated from below, which in turn exerts driving tractions on the base of a relatively stagnant 'crust' (later, 'lithosphere') to cause continental drift. In the early 1970s, more sophisticated understanding of convection led to the opposite view. It was realized that only a fraction of the Earth's heat flow originates in the core, while most results from radioactivity and/or secular cooling of the mantle. Computer models showed that internally heated (and/or surface cooled) systems have no upwelling sheets or plumes and that all concentrated flow originates in the upper cold boundary layer, which stirs the interior as it sinks. Thus it became natural to regard plates of lithosphere as driving themselves and, incidentally, stirring the rest of the mantle"5. Some researchers make the point emphatically: "convection does not drive plates." Upper mantle convection is a product, not a cause, of plate motions20. Thus the location and orientation of a sinking slab is the best indicator of which way upper mantle flows. "The advent of plate tectonics made the classical mantle convection hypothesis even more untenable. For instance, the supposition that mid-oceanic ridges are the site of upwelling and trenches are that of sinking of the large scale convective flow cannot be valid, because it is now established that actively spreading, oceanic ridges migrate and often collide with trenches"14. "Another difficulty is that if this is currently the main mechanism, the major convection cells would have to have about half the width of the large oceans, with a pattern of motion that would have to be more or less constant over very large areas under the lithosphere. This would fail to explain the relative motion of plates with irregularly shaped margins at the Mid-Atlantic ridge and Carlsberg ridge, and the motion of small plates, such as the Caribbean and the Philippine plates"19. Of the possible driving forces, a consensus has developed "that the dominant forces might operate either (1) from the side by 'slab pull' by the subducting plates (slabs) and 'ridge push' from mid-ocean ridges or (2) from below by mantle convection"8. "It is a simple matter to ascribe the driving force to gravity causing plates to slide downhill from mid-ocean ridges and pulling them into the asthenosphere at subduction zones, but it is a rare fluid dynamicist who would contend that these processes are understood"34. Ridge push has an additional meaning: the expansion of oceanic crust as it cools and thickens for up to 90 million years32. Numerical models compare a variety of factors. In some cases, forward basal drag by mantle flow is indicated. "In the most plausible model, this forward drag acts only on continents, while oceanic lithosphere experiences negligible basal shear tractions. Probably the dense descending slabs of oceanic lithosphere not only pull the oceanic plates, but also stir the more viscous lower mantle, and this in turn helps to drive the slower drift of continents"5. How capable is each option? The force generated by a sinking slab would be much higher, but its net effect is greatly reduced by various forms of resistance. This is especially so because the subduction trench retreats seaward (rollback). A common "misconception is that subducting plates roll over stationary hinges and slide down fixed slots"20, the way an escalator descends. A closer illustration would be a strip of paint peeling from a ceiling, although there is also a small amount of forward sliding - the net slab pull. There is general consensus for the net slab pull force listed above38. Laboratory experiments show that about 70% of the sinking slab's force is used to drive rollback-induced mantle flow; roughly 15 to 30% is used to bend the subducting plate at the trench; and 0 to 8% is used to overcome shear resistance between the slab and the mantle. The experiments indicate only 8 to 12% of the force of the sinking slab pulls the attached surface plate forward. Thus slab pull is about twice as large as the ridge push force40. We can avoid uncertainties regarding slab pull by considering the case of the South American plate. "Virtually all major mountain ranges in the world are a consequence of crustal shortening. To form mountain ranges, in general, horizontal forces must be applied to masses of crust and mantle, to lithospheric plates, to drive them together and to cause crustal shortening and crustal thickening"36. "The Andes shouldn't be there. Plate tectonics makes the world's great mountain ranges by slamming two continents together, as Europe collided with Africa to make the Alps or India ran into Asia to make the Himalayas. South America, however, is colliding with nothing more than the floor of the Pacific Ocean, which is slipping beneath the continent into Earth's interior. Such encounters between continent and ocean ordinarily throw up a few volcanoes, not a 7000-kilometer-long wall of mountains"25. A few researchers think South America is colliding with "the viscous mantle rock hundreds of kilometers down under the floor of the Pacific. Like a snub-nosed boat driven too fast for the strength of its hull, the central South American coastline has crumpled under the pressure"25. But what is driving the boat? The forward basal drag from trench suction just keeps the Pacific and Atlantic plates (including South America) from separating. The stress required for crustal shortening to build mountains has been calculated to be in a range from 1500 to 2500 bars12 up to 4000 to 6000 bars38, inferring the latter "from earthquake data and evaluation of the stresses required to produce specific geological structures". 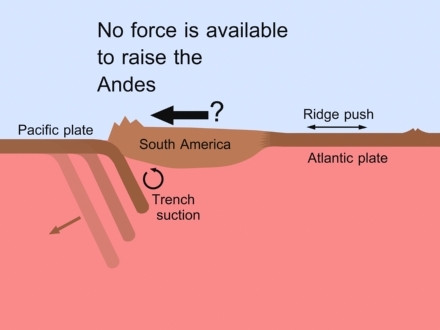 In the case of South America, the combination of ridge push and forward basal drag (by trench suction) could produce only 400 to 600 bars of force, which is clearly insufficient to build the Andes. These forces are already engaged in moving the entire plate westward! A researcher who acknowledged this failure was moved to suggest another mechanism (gravity glide) that had been discarded many years ago38 (and is still out of favor). At present, plate tectonics is too weak to provide the force needed to build the Andes of South America. The mountains of western North America resemble other mountains formed by collision such as the Himalayas. The Rocky Mountains are considered to have formed during the Laramide orogeny from 80 to 45 million years ago, in the latter half of the 180 million year long separation of North America from Africa. 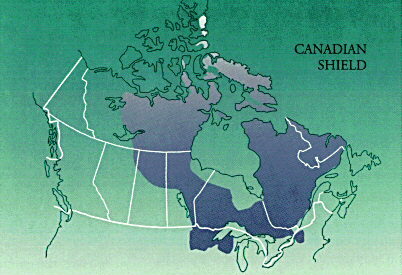 Yet western North America "lacks a 'collider',"31 something to push against to cause crustal shortening. Uplift is generally thought to have resulted from friction with the Farallon plate. Another study estimates the ridge-push force on North America at about 200 bars, and that the total basal forces "are of the same order as ridge push." They believe the basal force is driving the plate forward, not resisting.6 While the direction of basal flow has long been disputed, 7,8,29,42 even the best-case scenario (200 bars ridge push + 200 bars basal drive = 400 bars) is obviously inadequate to raise the vast mountain ranges of western North America. 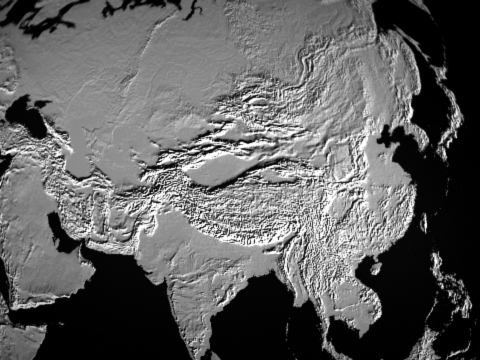 Tibetan Plateau - where's the driving force? "Relatively little is known about the absolute strength of the lithosphere and how such strength is distributed with depth." "The oceanic ridges are features with an excess potential energy... of about 1.2 x 1012 N/m." "Estimates of the upper-crustal strength inferred from stress measurements in the KTB (Continental Deepbore Drilling Program) wellhole in Germany show that the cumulative force needed to deform crustal material is in the range of 2 to 5 x 1012 N/m. "10 If the ridge push force equates to about 200 bars, then crustal deformation alone requires from 330 to 830 bars. As the above discussion illustrates, the force needed to deform the crust and raise the Himalayas far exceed the capability of plate tectonics mechanisms. Is basal drag the answer? "We find mean basal shear tractions of no more than 1 MPa for the six largest slabless plates: Africa 0.2 MPa; Antarctica 0.1 MPa; North America 0.6 MPa; Eurasia 1.0 MPa; South America 1.0 MPa; Somalia 0.9 MPa ".4 These values are integrated over the area of the plate. Clearly, basal drag is not the solution to Plate Tectonics' problem in generating enough force to build mountains. "The subduction process is more a passive feature rather than being a driving mechanism of plate motions." Most dipping slabs are being compressed at depths typically shallower than 300 km, indicating slabs forced to sink rather than falling away. "Some plates... move without any slab pulling them, for example the westward movements of North America, Africa, and South America. Trench suction has been proposed to explain these movements, but beneath both North and South America the mantle is moving relatively eastward, opposite to the kinematics required by the trench suction model." "The African plate moves westward without any slab in its western side. Moreover, it moves opposite to a hypothetical Atlantic ridge push." "The energy required to pull the plates is far higher than the strength that plates can withstand under extension." The subducted slab is likely able to sustain the load induced by slab pull, but this load probably cannot be transmitted to the rest of the plate without breaking it apart. "The slab pull concept is based on the hypothesis of a homogeneous composition of the upper mantle, with the lithosphere sinking only because it is cooler. However, the oceanic lithosphere is frozen shallow asthenosphere, previously depleted beneath a mid-oceanic ridge. Depleted asthenosphere is lighter than the 'normal' deeper undepleted asthenosphere. Therefore the assumption that the lithosphere is heavier only because it is cooler might not be entirely true, and the slab pull could be overestimated." "Within a slab, eclogitization [(transforming to eclogite under increased pressure and temperature)] is assumed to make the lithosphere denser. However, eclogitization is concentrated in the 6-8 km thick oceanic crust, whereas the remaining 60-80 km-thick lithospheric mantle does not undergo the same transformation. Therefore only 1/10 of the slab is apparently increasing in density, but the main mass of the slab (90%) does not change significantly." "Nevertheless, this type of metamorphic transition is often assumed to be able to determine the slab pull." The small density contrast between subducting crust and mantle casts doubt on the effectiveness of slab pull. Tomographic images of earth's interior are often used to show subduction. However, "low velocity volumes of the mantle detected by tomography can be due to lateral variations in composition rather than in temperature, i.e., they can be even higher density areas rather than hotter, lighter buoyant material as so far interpreted." "As extreme examples, gold or lead have high density but low seismic velocity. Therefore the interpretation of tomographic images of the mantle where the red (lower velocity) areas are assumed as lighter and hotter rocks can simply be wrong, i.e., they may even be cooler and denser. With the same reasoning, blue (higher velocity) areas, which are assumed as denser and cooler rocks may even be warmer and lighter." Sometimes pieces are assumed to have detached from slabs and fallen away, and appear as blobs on tomographic images. "Tomographic images are based on velocity models that often overestimate the velocity of the asthenosphere where usually the detachment is modeled. Therefore the detachment disappears when using slower velocity for the asthenosphere in the reference velocity model, or when generating regional tomographic images with better accuracy." "If oceanic lithosphere is heavier than the underlying mantle, why are there no blobs of lithospheric mantle falling in the upper mantle below the western, older side of the Pacific plate?" Slab dip has been thought to be related to its age, as in "the western Pacific subduction zones because the subducting western Pacific oceanic lithosphere is older, cooler and therefore denser. However, the real dip of the slabs worldwide down to depths of 250 km shows no relation with the age of the downgoing lithosphere." 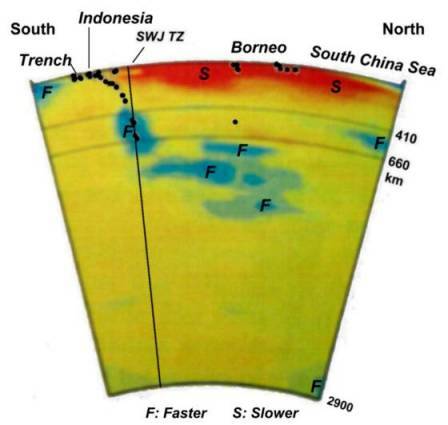 We are supposed to believe that "the 700 km-long West Pacific slab... should pull and carry the 10,000 km-wide Pacific plate, 33 times bigger, overcoming the shear resistance at the plate base and the opposing basal drag induced by the relative eastward mantle flow." "The negative buoyancy [(dense enough to sink)] of slabs should determine the pull of plates, but it has been shown that the dip of the subduction zones is not correlated with the age and the thermal state of the downgoing plates." "In fact there are slabs where, moving along strike, the age of the downgoing lithosphere varies, but the dip remains the same, or vice versa, the age remains constant while the dip varies (Philippines). There are cases where the age decreases and the dip increases (Western Indonesia), and other subduction zones where the age increases and the dip decreases (Sandwich). This shows that there is not a first order relationship between slab dip and lithospheric age." Finally, no matter how it is computed, "results do not support a correlation between slab length percentage (length of the trench compared to the length of the whole boundary around the plate) and plate velocity." "This long list casts doubts on the possibility that slab pull can actually trigger subduction... and drive plate motions." Why should the lithosphere start to subduct at all? "Hydrated and serpentinized oceanic lithosphere that has not yet been metamorphosed by the subduction process... is still less dense." Slab pull has been calculated to become potentially efficient only at a certain depth, around 180 km. Shallower than that, how is subduction initiated? 1. Alvarez, Walter. 2010. Protracted continental collisions argue for continental plates driven by basal traction. Earth and Planetary Science Letters, Vol. 296, pp. 434-442. 2. Alvarez, Walter. October 1990. Geologic Evidence For The Plate-Driving Mechanism: The Continental Undertow Hypothesis And The Australian-Antarctic Discordance. Tectonics, Vol. 9, No. 5, pp.1213-1220. 3. Alvarez, Walter. August 10, 1982. Geological Evidence For The Geographical Pattern of Mantle Return Flow and the Driving Mechanism of Plate Tectonics. Journal of Geophysical Research, Vol. 87, No. B8, pp.6697-6710. 4. Bird, Peter, Zhen Liu, William Kurt Rucker. 2008. Stresses that drive the plates from below: Definitions, computational path, model optimization, and error analysis. Journal of Geophysical Research, Vol. 113, B11406, pp. 1-32. 5. Bird, Peter. May 10, 1998. Testing hypotheses on plate-driving mechanisms with global lithosphere models including topography, thermal structure, and faults. Journal of Geophysical Research, Vol. 103, No. B5, pp.10,115-10,129. 6. Bokelmann, Goetz H. R., Paul G. Silver. 2002a. Shear stress at the base of shield lithosphere. Geophysical Research Letters, Vol. 29, No. 23, pp. 6-1 to 6-4. 7. Bokelmann, G.H.R. 2002b. Convection-driven motion of the North American craton: Evidence from P-wave anisotropy. Geophysical Journal International, Vol. 248, No. 2, pp. 278-287. 8. Bokelmann, G.H.R. November 2002c. Which forces drive North America? Geology, Vol. 30, No. 11, pp.1027-1030. 9. Bott, M.H.P. 1993. Modelling the plate-driving mechanism. Journal of the Geological Society, London, Vol. 150, pp.941-951. 10. Coblentz, David D., Randall M. Richardson. August 1994. On the gravitational potential of the Earth's lithosphere. Tectonics, Vol. 13, No. 4, pp. 929-945. 11. Doglioni, Carlo, Eugenio Carminati, Marco Cuffaro, Davide Scrocca. 2007. Subduction kinematics and dynamic constraints. Earth Science Reviews, Vol. 83, pp. 125-175. 12. England, Philip, Gregory Houseman. March 10, 1986. Finite Strain Calculations of Continental Deformation 2. Comparison With the India-Asia Collision Zone. Journal of Geophysical Research, Vol. 91, No. B3, pp.3664-3676. 13. Flesch, Lucy M., A. John Haines, William E. Holt. August 10, 2001. Dynamics of the India-Eurasia collision zone. Journal of Geophysical Research, Vol. 106, No. B8, pp. 16,435-16,460. 14. Forsyth, Donald, Seiya Uyeda. 1975. On the Relative Importance of the Driving Forces of Plate Motion. Geophysical Journal of the Royal Astronomical Society, Vol. 43, pp.163-200. 15. Ghosh, Attreyee, William E. Holt. 17 February 2012. Plate Motions and Stresses from Global Dynamic Models. Science, Vol. 335, pp. 838-843. 16. Ghosh, A., W.E. Holt, L. Wen, A.J. Haines, L.M. Flesch. 2008. Joint modeling of lithosphere and mantle dynamics elucidating lithosphere-mantle coupling. Geophysical Research Letters, Vol. 35, L16309, pp. 1-5. 17. Ghosh, Attreyee, William E. Holt, Lucy M. Flesch, A. John Haines. May 2006. Gravitational potential energy of the Tibetan Plateau and the forces driving the Indian plate. Geology, Vol. 34, No. 5, pp. 321-324. 18. Gung, Yuancheng, Mark Panning, Barbara Romanowicz. 17 April 2003. Global anisotropy and the thickness of continents. Nature, Vol. 422, pp.707-711. 19. Guptasarma, D. 2002. Plate Tectonics--Some recent Results, Questions, and Mechanisms. in Dynamics of Earth's Fluid System, eds. Rai, S.N., D.V. Ramana, A. Manglik. Lisse. 20. Hamilton, Warren B. 2002. The Closed Upper-Mantle Circulation of Plate Tectonics. in Plate Boundary Zones, Geodynamics Series Volume 30, eds. Seth Stein and Jeffrey T. Freymueller, 425 pgs, pp. 359-410. 21. Holt, W., A. Ghosh, L. Wen. 2009. Constraints from Surface Geophysical and Geological Observations on the Role of Lithosphere-Mantle Coupling. American Geophysical Union Spring Meeting 2009, Abstract #T11A-01. 22. Humphreys, Eugene D., David D. Coblentz. 21 July 2007. North American Dynamics and Western U.S. Tectonics. Reviews of Geophysics, Vol. 45, RG3001, 30 pages. 23. Jimenez-Munt, Ivone, John P. Platt. 2006. Influence of mantle dynamics on the topographic evolution of the Tibetan Plateau: Results from numerical modeling. Tectonics, Vol. 25, TC6002, 17 pgs. 24. Kennett, B.L.N. 17 April 2003. Roots of the matter. Nature, Vol. 422, pp. 674-675. 25. Kerr, Richard A. 1 September 1995. Earth's Surface May Move Itself...But Did Deeper Forces Act To Uplift the Andes? Science, Vol. 269, pp.1214-1216. 26. Kley, Jonas, Tim Vietor. 2007. Subduction and Mountain Building in the Central Andes. in The seismogenic zone of subduction thrust faults, eds. Timothy H. Dixon and J. Casey Moore, Columbia University Press, pp. 624-659. 27. Korenaga, Jun. 2007. Thermal cracking and the deep hydration of oceanic lithosphere: A key to the generation of plate tectonics? Journal of Geophysical Research, Vol. 112, B05408, 20 pages. 28. Lin, Fan-Chi, Michael H. Ritzwoller, Yingjie Yang, Morgan P. Moschetti, Matthew J. Fouch. January 2011. Complex and variable crustal and uppermost mantle seismic anisotropy in the western United States. Nature Geoscience, Vol. 4, pp. 55-61. 29. Liu, Zhen, Peter Bird. 2002. 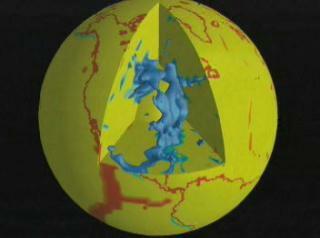 North America plate is driven westward by lower mantle flow. Geophysical Research Letters, Vol. 29, No. 24, pp. 17-1 to 17-4. 30. Maggi, A., J.A. Jackson, D. McKenzie, K. Priestley. June 2000. Earthquake focal depths, effective elastic thickness, and the strength of the continental lithosphere. Geology, Vol. 28, No. 6, pp. 495-498. 31. Maxson, Julie, Basil Tikoff. November 1996. Hit-and-run collision model for the Laramide orogeny, western United States. Geology, Vol. 24, No. 11, pp. 968-972. 32. Meijer, P.Th., M.J.R. Wortel. July 30, 1992. The Dynamics of Motion of the South American Plate. Journal of Geophysical Research, Vol.97, No. B8, pp.11,915-11,931. 33. Miyashiro, Akiho, Keiiti, Aki, A.M. Celal Sengor. 1982. Orogeny. John Wiley & Sons, New York. Pages 204-5. 34. Molnar, Peter. 8 September 1988. Continental tectonics in the aftermath of plate tectonics. Nature, Vol. 335, pp. 131-137. 35. Molnar, Peter, Philip England. April 10, 1990. Temperatures, Heat Flux, and Frictional Stress Near Major Thrust Faults. Journal of Geophysical Research, Vol. 95, No. B4, pp. 4833-4856. 36. Molnar, Peter, Helene Lyon-Caen. 1988. Some simple physical aspects of the support, structure, and evolution of mountain belts. Geological Society of America Special Paper 218, pp.179-207. 37. Nettles, Meredith, Adam M. Dziewonski. 2008. Radially anisotropic shear velocity structure of the upper mantle globally and beneath North America. Journal of Geophysical Research, Vol. 113, B02303, pp. 1-27. 38. Price, Neville J. 2001. Major Impacts and Plate Tectonics - A model for the Phanerozoic evolution of the Earth's lithosphere. London. 39. Russo, R.M., P.G. Silver. June 1996. Cordillera formation, mantle dynamics, and the Wilson cycle. Geology, Vol. 24, No. 6, pp.511-514. 40. Schellart, W.P. 2004. Quantifying the net slab pull force as a driving mechanism for plate tectonics. Geophysical Research Letters, Vol. 31, L07611, 5 pgs. 41. Scoppola, B., D. Boccaletti, M. Bevis, E. Carminati, C. Doglioni. January/February 2006. The westward drift of the lithosphere: A rotational drag? GSA Bulletin, Vol. 118, No. 1/2, pp. 199-209. 42. Silver, P.G., W.E. Holt. 8 February 2002. The Mantle Flow Field Beneath Western North America. Science, Vol. 295, pp. 1054-1057. 43. Silver, P.G., Raymond M. Russo, Carolina Lithgow-Bertelloni. 2 January 1998. Coupling of South American and African Plate Motion and Plate Deformation. Science, Vol. 279, pp.60-63. 44. Smith, Alan D., Charles Lewis. 1999. The planet beyond the plume hypothesis. Earth-Science Reviews, Vol. 48, pp.135-182. 45. Smith, Alan D., Charles Lewis. 1999. Differential rotation of lithosphere and mantle and the driving forces of plate tectonics. Geodynamics, Vol. 28, pp.97-116. 46. Whittaker, A., M.H.P. Bott, G.D. Waghorn. July 30, 1992. Stresses and Plate Boundary Forces Associated With Subduction Plate Margins. Journal of Geophysical Research, Vol. 97, No. B8, pp. 11,933-11,944. 47. Wilson, M. 1993. Plate-moving mechanisms: constraints and controversies. Journal of the Geological Society, London, Vol. 150, pp.923-926.